macaroni & cheese: It's a Two-post Day!!! Hurray!! It's a Two-post Day!!! Hurray!! Golden D'or is currently having a sale and it's a pretty good one!! I found got 5 yards of heavy black French terry and about 3 yds of light camel wool for .99 yard!!! 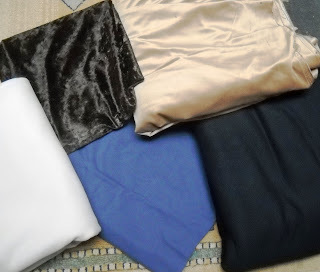 I also found a remnant of a silky rib, in an almost-purple indigo for .99/yd, and a camel velour for $2/yd and finally some dark brown stretch panne velvet for $3/yd. I only got a yard of that. And I didn't even have to use my 30% off coupon!! I may go back and use my coupon on some elastic. They had a nice Donna Karan woman's underwear elastic (boxer style) that would be useful, as well as the regular everyday stuff. William has fallen in love with our flannel sheets, mainly the pillow cases. 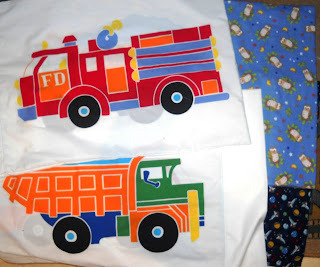 He kept stealing Doug's pillow, so I whipped up some pillow cases for the boys today. The trucks are from panel yardage (Golden D'or purchase, 8 mths ago) that has a fire truck on one side and a dump truck on the other. What's cool about this, that I didn't realize when I bought it, is that when I cut it the proper width for a pillowcase, the bottom yardage was big enough to make the casing on the ends!! BRILLIANT!!! 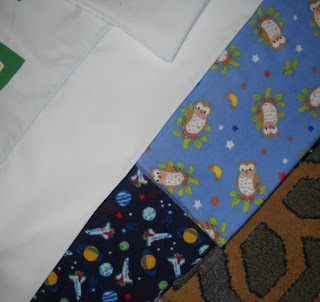 I made Aldous a flannel one with owls, and William's flannel one has the space shuttle. I just made a nice wide hem on the flannel pillowcases. On the truck pillowcases, after I attached the edge, I top-stitched to make the inside seam flat. And it looks nice. Ok, back to work!!! I think I want to make one of those things to dispense grocery bags. Despite my best efforts, they are still creeping into my house. Your pillow cases are so nice. I made one and felt quite proud of myself. I need to take a photo of it. And I need to go to GD'O soon. Where did you get the coupon? You are so creative! I need to read your blog more often so I can get inspired, and get a little confidence in that area.